Streamfeeder Pro Series Speed Following is an option now available on all new Streamfeeder Pro Series feeders/dispensers. Streamfeeder Speed Following enables you to automatically adjust the speed of the feeder/dispenser in relation to the speed of the conveyor. The Streamfeeder Speed Following option will be displayed as a menu item in the Streamfeeder I-Quipped intelligent control system of Streamfeeder Pro Series feeders/dispensers. Included with the Streamfeeder Speed Following option is an encoder module which can be mounted to the drive shaft of the conveyor in various configurations. 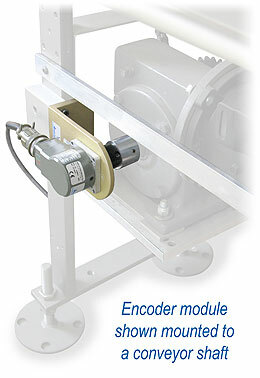 The encoder detects the speed of the conveyor in real-time and communicates it to the feeder/dispenser. The speed at which products leave the feeder/dispenser are then automatically and continuously adjusted. This allows for greater accuracy of product placement at varying speeds.